Over the next few days and weeks I will be releasing a series of basic photography tips that I think are worth while sharing, inspirational, and hopefully make for better Photography. I am always thrilled to get feedback and comments or suggestions. Hope you enjoy the photo tips and find them helpful! 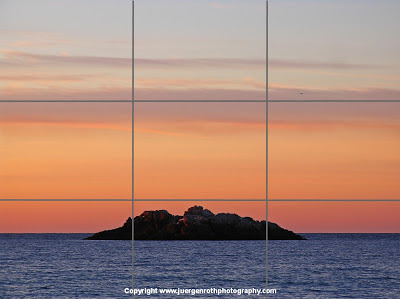 Photo Tip #9 of 20: Use the Rule of Thirds as a guideline or starting point for your composition. Draw a raster board over the picture in your mind or check your camera manual to see if it is available as a feature on your digital camera. In this landscape photography image I placed the horizon low because the orange sky (2/3 of the image) was more appealing then the blue cold Atlantic Ocean. The bird in the upper right corner and the early sunlight striking the rock in the lower 1/3 of the picture added the icing to the cake.